Email was used this year as a key part of marketing campaigns to bolster and drive ecommerce practices and to drive qualified leads. With relevancy and dedicated content focused on continuing customer conversations, marketers were able to build lasting relationships. Read the nine most popular case studies from this year to see how marketers from both B2B and B2C companies best utilized email. In the articles below, you’ll see how marketers across companies and spheres used email as a key driver in overall marketing campaigns — saving customers from irrelevant messaging, challenging so-called “best practices” and optimizing beyond batch-and-blast. These marketers showed a constant willingness to do away with email programs that weren’t working for their customers. Instead, launching a comprehensive email campaigns that kept focus on addressing customer pain points and fostering conversation. There is no ideal email send frequency that will fit all brands' needs. Therefore, marketers face the challenge of finding and fine-tuning the optimal frequency for their brands with rigorous testing and evaluation. Read this MarketingSherpa case study to discover the relationship between email send frequency among apparel retailers and to learn how to optimize your send frequency for customer engagement, regardless of industry. A third-generation, family-owned wine merchant Zachys Wine & Liquor was mostly focused on offline retail. But in 2013, the marketing team began optimizing online shopping for its customers, with triggered emails based on behavior as the cornerstone of that shift. Zachys has three major business divisions, according to Victor Castro, Director of eCommerce, Zachys Wine & Liquor. It has a retail store presence, one location in Scarsdale, New York, and an online retail website, one feature of which is an auction group. In terms of email marketing, Castro added, there was a lot of content being put out, but it also wasn’t really managed. “[My] position was basically brand-new to the company. They never really had anybody in charge. And so when it was presented to me, and I was looking at the opportunity, it was clear that there were a lot of different pieces that could be improved,” he said. See how they were able to grow ecommerce by 53% while starting three triggered campaigns to help reclaim cart browse and search abandoners. 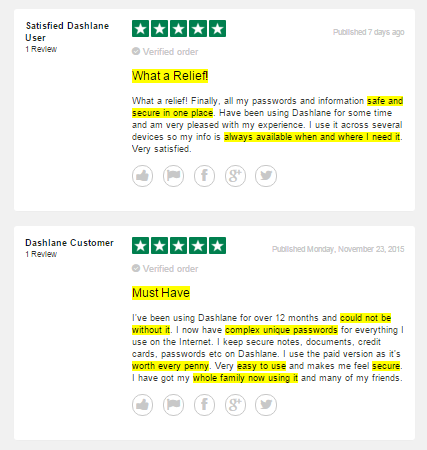 As more and more personal data is stored online, the most important question password manager Dashlane needed to answer for customers was, "Can you be trusted?" As a password manager and digital wallet, Dashlane operates in the space of "making identities and online checkouts easier and more secure," David Rostan, Head of Organic Marketing, Dashlane, said. When Rostan and his marketing team reach out to customers, they try to "flip the switch in their head that says, 'Hey, yeah, passwords and online checkouts are a big hassle, but I wasn't really thinking about it until you just mentioned it,'" he said. The thing that might be stopping people from purchasing, he said, is that this is a fairly new technology for people who haven't yet considered incorporating password management technology into their lives. "So their first question is, 'Is this a leap I'm willing to make? Can I trust it?' They don't really understand maybe how it works and how it makes them safer and more secure," he said. The Dashlane marketing team was looking to communicate that value proposition much more quickly accompanied by some third-party verification, he said, so "you don't even have to take our word for it." The team decided to utilize customer reviews across several efforts — particularly into email campaigns. "It allows other people to speak for us about their experience, and that takes us out of the equation from our bias so people can trust what they're hearing before they really know us well," Rostan said. Another aspect of reviews is the inclusion of an instantly recognizable rating symbol — five stars — to immediately and simply communicate value. "More than just brand trust, we were looking for trust at that initial point of contact," he said. To execute this, the marketing team began collecting customer reviews and utilizing them in paid ad campaigns, landing pages and email marketing. They were able to collect over 300 reviews, 97% of which were four stars or higher. This past year alone, Golf Channel was able to increase the size of its subscriber database by 32%. "A common misconception is that Golf Channel is only a network, but in actuality, we are at the intersection of golf and lifestyle," Carolina Castaneda, Digital Marketing Director, Golf Channel, said. Golf Channel has different silos within the marketing department to help reach all of its customers, with Castaneda residing within the digital marketing team, but also focusing on social media, search, email, content and digital sponsorship, among others. "Our email marketing program has been in existence for several years now. But what we were noticing back in 2013 and at the start of 2014 is that our database growth was flat," Castaneda said. Golf Channel recognizes that email is a "huge driver of consumption, whether that's going on GolfChannel.com or downloading our app or watching our videos. So we felt very invested in taking a look at why that was — why was our database flat and how could we change that," she said. The digital team was confident the first step in changing that was to actually let people know there was an email offering. Golf Channel didn't really promote the email channel much before the summer of 2014, according to Castaneda. "One of the challenges that we had initially was that if you went to our site, you really couldn't see [the email option] anywhere. You had to scroll all the way down to the bottom of the page in order to see an email icon and know there was a newsletter," she said. They deployed these tactics with the goal of growing the database by 10%, initially. At this point, the digital team has been able to grow it 32% — more than tripling their original goal. Lifestyle brand and ecommerce store Dormify wanted to maximize the impact of its email communications by ditching the batch-and-blast system and adopting relevant, automated email series. "We service everyone from those college freshmen moving into dorm rooms, to post-grads in apartments, to teens that are decorating their bedrooms at home," said Nicole Gardner, Chief Operating Officer, Dormify. Previously, Gardner said, Dormify had "definitely more of a batch-and-blast approach. We didn't have as much ability to segment as we do now. We also didn't have as many automated programs." For her and her team, it came down to tending to the different needs of all of Dormify's customers. "It made it difficult to address [those needs] with a one-shot kind of blanket promo approach. So for Dormify, we have a lot of different audience segments," she said, adding that the primary customer segment is incoming college freshman. Her team found that they were sending too many irrelevant messages to too many people. "We really saw that there was this opportunity to serve up our customers with the most appropriate content if we could start to work toward both segmentation and automation," Gardner said. Dormify wanted to give customers that relevancy, but didn't want to face the challenge of manually crafting so many different promotions, which is where automation came in. "Whether it was a welcome series or shopping cart abandonment … [we used] series like that where we could send out targeted appropriate messages at the right time," she said. Over the past year, Gardner and her team have been personalizing three automated email series: a welcome series, cart abandonment and a post-purchase. 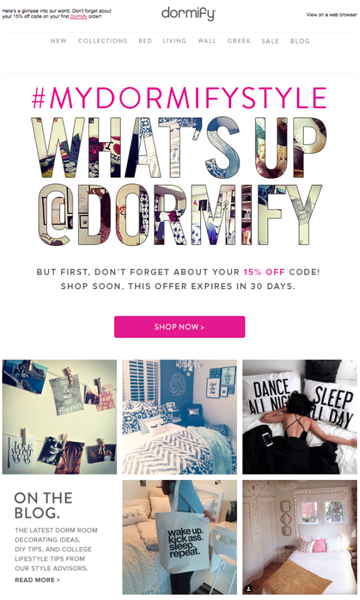 By establishing these personalized sends, Dormify saw a 92% increase in email revenue with the email audience converting at almost two times the site average. Jessica Vogel, Senior Global Marketing Manager, Dell, and her team saw an opportunity in what a lot of marketers would consider a hassle — transitioning to a new email service provider. Vogel said that generally, "We have made a strategic decision to focus on omni-channel and the customer journey, which has helped us align to drive efficiencies and strategic changes throughout the organization. As email continues to be a springboard to many of the big vehicles, it is something that needs to remain a priority." She added, “As we transitioned partners and major processes, it [was] a really good time to go back and revisit some things that have been in place," she said. The team was trying to find ways to improve across the board as they were re-coding email templates "and, of course, looking for ways to optimize the template to have it get a fresh, new look and increase all of our key performance indicators, if possible," she said. The specific goal they identified for the effort, covered in this case study, was to determine the impact of changing the position of the typical email's top navigation panel. It's a small change for such a large company, but the team wanted to drill down to smaller aspects to see if they could be a catalyst for bigger improvements. According to Vogel, the team asked themselves, "You'll see many brands include navigation within their email template, but why? Is it really a 'best practice'?" Previously, there was a lot of focus on creating a similar email-to-site experience, she added, "but our hypothesis was that moving the traditional top navigation to the email footer could lead to greater hero engagement, and ultimately increase performance." Historically, she said, the header had received a lot of browsing clicks, and the goal was not to lose those clicks but to repurpose them to drive more traffic further down the purchase path to a higher converting page. "We have already implemented some innovations like HTML5 video, adaptive content [and] animated GIFs … but there was an opportunity to revisit the basics and redirect browsing traffic to converting traffic," she said. As a result, the team decided to run an A/B split test to learn and understand what the results would look like for the Dell consumer segment. This change encouraged them to focus on the "bones" of an email — the template — and test a new approach that helped customers gravitate to the primary call-to-action more consistently. 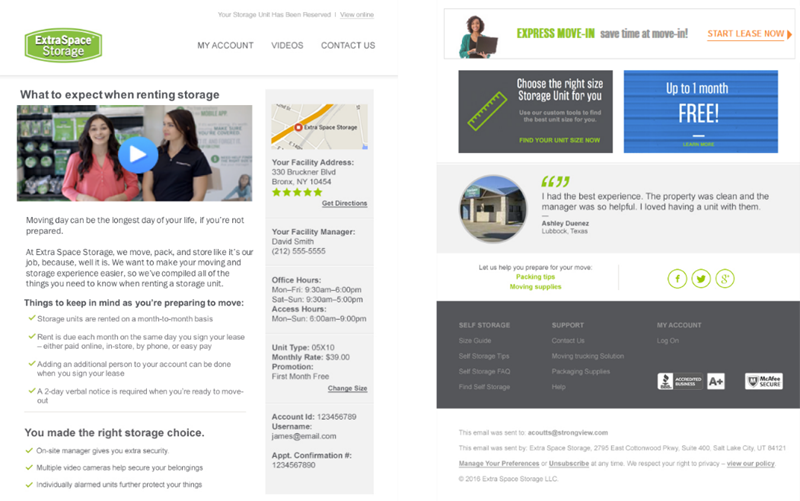 The team at Extra Space Storage knew they were missing opportunities with customers using their business-first email program. They decided to tear it down to the studs and rebuild it as a customer-first email program. Extra Space Storage has 1,400 storage facilities and close to 800,000 actual units across the country. Those numbers translate into customers with a wide variety of needs and backgrounds. “We are here to support people when they are going through life transitions. I know a lot of people look at the storage industry, and they say that it's a bunch of empty garage space, but we don't ever look at it that way,” said Jennifer Stamper, Interactive Marketing Manager, Extra Space Storage. Stamper explained that the customer base is unique in that the company doesn’t cater to one specific demographic. Internal data shows that storage facility customers share a commonality in that they are usually going through some kind of emotional life transition, like moving, marriage, divorce or the death of a loved one. “We know that there are strong emotions tied to the storage purchase … Extra Space Storage is storing people’s lives in [its] units. To alleviate the stress and emotions tied to this purchase experience, we researched to find out the main questions our customers have at the point of rental,” she said. Based on the findings, Stamper and her team created reservation emails with supporting videos to answer the questions customers have before they actually visit an Extra Space Storage facility. The storage space business model is similar to the rental car industry, Stamper explained. This means that customers can make a reservation without commitment, and the actual profit happens when they show up to rent the storage unit. Nearly half of the customers renting with Extra Space Storage have never used storage before, according to Stamper. They have no experience with a selecting a storage unit, the lease process or what questions to ask before visiting storage facilities. Because of this, customers were reaching out to the call center and visiting the website at all hours of the day. Using videos in email, Extra Space Storage customers were able to consume the educational video content right from their inbox, optimizing their customer experience, Stamper said. She and her team also used personalization to provide contextually-relevant value with a real-time, location-based weather feed that provided move-in tips. By providing education and guidelines about the self-storage rental process, anticipating needs, and helping customers make informed purchase choices with Extra Space Storage, they were also building customer confidence. “The end goal for us was always conversion. It's just seeing more people walk through the door,” she said. See how the team reworked templates, personalized sends and addressed customer pain points to drive a 50% jump in attributed conversion rate for email — a first in company history. Manufacturing company Strongwell Corporation’s primary customers are structural engineers, architectural firms and large constructors who are designing and building structures generally on the commercial level, although there are some on a consumer level, according to Barry Myers, Marketing Manager, Strongwell. Prior to that, the newsletter was sent out about every three to four months, and Myers and his team would take the Excel spreadsheet with the email list and manually update unsubscribes and other details. "I obviously quickly recognized; that's not the way we needed to be acting. We have tried to shift a lot of our print subscribers to the digital world simply for the fact that there's a lot less cost involved … and it gives us an opportunity to communicate with [customers] so much easier from both sides of the spectrum," he said. One of the early changes the team undertook was integrating into a CRM as a company. Myers is on the core team for that CRM installation, integration and ongoing updates. "One of the things that we really wanted to focus on in a marketing world is how [we can] use CRM to our advantage. I began looking for marketing automation platforms. It took quite a while — two, almost three years — before I really feel like now we've got a good grasp on what we're doing," he said. The team started a monthly email campaign rather than a newsletter, and in it, focused on creating a sales push with calls-to-action and so forth that "[they] just weren't able to do before," Myers said. In the case study below, see how the team integrated the automation system and worked closely with the sales team to qualify leads and nurture them with a drip campaign. Strongwell transformed its email marketing and alignment through marketing automation — so much so that it was able to pull a $30,000 project into the sales funnel after its improved email nurture campaign was put in place. When United Capital, a private financial life management company out of Newport Beach, California, rebranded its weekly newsletter to focus on the prospect journey, its included content also needed a different focus. Through extensive primary consumer research, said Christina Martin, Vice President, Digital Marketing, United Capital, the company knows that its "prospects and clients think about their overall financial life more in terms of four areas — not just saving and investing — which is what traditionally people in the wealth management space talk about. But they also think about working and spending." These customers are looking for planning services "not just for their retirement, but shorter use terms of money all the way through their life, and then also managing their money through our guided services," she said. The company has an enterprise marketing team, catering to both B2B and B2C, and Martin's team is digital, supporting the enterprise and the segment marketers. Martin and her digital team send out a weekly email newsletter to both prospects and clients labelled FinLife Digest, which previously used a third-party content curation service. In March 2015, the digital team decided to take advantage of the original content created on the blog and merge it with the curated content. "We expanded the scope of [the newsletter] to include not just curated content, but [also] the original content that United Capital writes as part of our content marketing strategy," she said. "So it's a mix of both original and curated content, which is something a little bit different than what most people are doing for their customer or prospect email." The newsletter also supports the inbound marketing strategy, Martin said. The team offers prospects numerous pieces of "value-added content" in both gated and free settings. By integrating original content authored by internal subject matter experts instead of solely using curated content, the digital marketing team was able to increase newsletter engagement by 145% in one year. "The State Fair of Texas is a 130-year-old event that started in 1886 at Fair Park in Dallas. We've been at the same location for all 130 years," Jason Hays, Director of Creative Services, State Fair of Texas, said. The Fair is a 24-day event that operates the last Friday of September through usually the third Sunday in October. There are about 3 million visitors to the Fair each year, Hays said, and "that number has been pretty stable over the past 20-some odd years. 3 million in 24 days — it's quite an event." Operating on 277 acres, a lot of that space is filled with entertainment for visitors, he added. With a population of nearly 7 million people in the Dallas-Fort Worth Metroplex, 3 million visitors to the Fair translates into a very wide audience. The State Fair of Texas is a well-known and successful event, Hays said, that brings its own set of unique challenges. Because they have such high attendance numbers, the team hadn't seen a strong need to advertise or market to their audience. "That changed in the past few years. We noticed it was doing a little bit of a disservice to us in the fact that we weren't able to tell our story if we weren't marketing in an appropriate way," he said. The team decided to turn to email marketing, which prior to this effort the team, Hays added, “had toyed with it and used it in a very general way." They saw it as an excellent way to tell the Fair's story during the fair season, which they consider to be the 60 days before the fair all the way to its last operating day. Also, the question became, "How do we use the other 300 days throughout the year to share what the impact of your visit to the fair [does] in our community?" Additionally, they needed to collect as many names and information on the email list as possible because 2016 will be the first year featuring print-at-home tickets. "Knowing that we were going into 2016 with that program, our main focus … with marketing was adding to the database," he said. To encourage ticket sales, the team incentivized email sign-ups through the opportunity to win free tickets every 30, 65 and 100 days. This also kept customers engaged with Fair content year-round, building excitement to the main event and increasing overall revenue for 2015 by 30%.